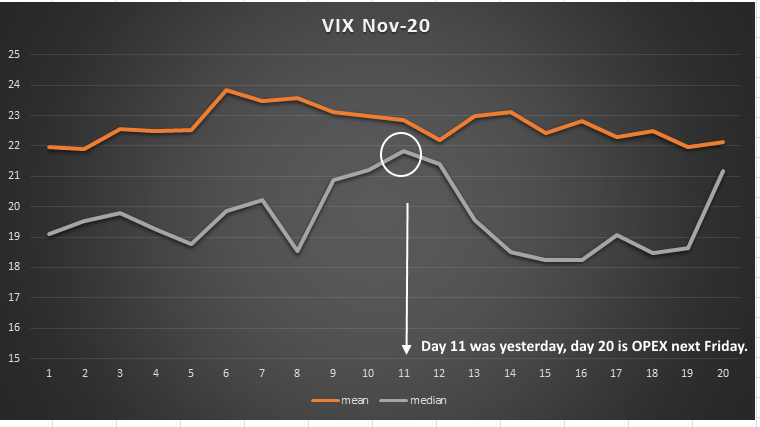 As you can see, yesterday was clearly the median high point for volatility historically since 1990, and the market cheerfully obliged by selling off. Why does this happen? One can speculate using the Stock Traders Almanac, and simply looking at how the market tends to perform heading into the middle of November. From a common sense perspective, the majority of earnings have passed, the news is out, and the market tends to fatigue. Individual shorts can re-enter, without earnings risk being in the way. Institutional investors tend to buy on the first day of the month as well, supporting early November performance. As readers of my former newsletter knew, this was one of my superb tools for trading not only SPY options, but VXX, SVXY, and UVXY options as well. One key in the process of entering good risk/reward scenarios is to create a mosaic with a tool kit of excellent and proven data models, and this is an example. This is far from predictive, no single historical data tool is. We could have an earthquake in California next week, (one of my bigger investing fears, btw) that would render this useless. But that is an entirely different point that strikes to risk management.